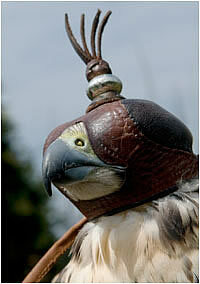 "Falconry is an ancient art which is very demanding yet rewarding. It allows us through our knowledge and care to share our lives with a wild and magnificent top predator"
We offer several courses at Abbotts Mews at Beaulieu Abbey on the Beaulieu Estate (and The Countryside Education Trust) in the New Forest one of which works towards the Lantra "Beginning Falconry" Certificate. Alternatively, we will be pleased to structure courses to suit your needs, please call us to discuss or send details of your requirements. 10.00am - 1.00pm, Scheduled Saturday and Sundays throughout the year and other days by arrangement. Participants will gain a basic understanding of birds of prey, their training and care, whilst providing hands-on experience of holding and flying a bird. This very popular course is often chosen as a gift for friends and loved ones. Individual participants will join a small group of up to six persons. Alternatively, a one to one experience is available for both half and whole days. Call today with your preferred dates. Amews Falconry, has teamed up with the wonderful Hawk Conservancy Trust, to offer the LANTRA "Beginning Falconry" course at the Trust near Andover. This 4-day course in bird of prey management and husbandry has the option of an assessment to achieve the LANTRA Award. The course is designed to teach the beginner, with little or no knowledge, how to prepare for, source, select and care for birds of prey. The course runs over four days (10am – 4pm). There will be additional homework between sessions. Participants will be assessed on the final afternoon on the practical elements of the course. Following the course, there is an extended period for workbooks to be completed and assessed to attain the Lantra Award. Lunch, tea and coffee, all your training and equipment and Lantra certificate, if attained, are included in the price. Also included is a complimentary adult admission ticket to the Trust. To book your place, please call the Hawk Conservancy Trust office on 01264 773850 between 9am and 5pm.